San Diego, clean, crisp, polished, has a perfect temperature, a dramatic coast, stunning scenery, interesting places to see, activities to please everyone, but above all, it has “good vibrations”- the Beach Boy mellow life blending seamlessly with the chic and upscale. It’s city, mesa, country and desert; crashing surf, stretches of beach and fruitful fields. With cliffs leading to the sea, year-round average temperature of 65°, Spanish- influenced architecture, and flowers, hanging, terraced and tiered, it has the feel of a Mediterranean coastal town. Trendy yet not flashy, it is a place where military order coexists with surfer lifestyle; where historic roots underlay transitory fads. People like to live here, so much so that, like the rest of coastal California, it is densely populated. However, with a landscape of cliffs rising up from the vast Pacific, a large, open bay and an expansive coastline, it does not have the feel of urban sprawl. Neatly tucked between Freeway 5 and the San Diego Harbor, downtown San Diego does not overwhelm. Similarly, communities in the larger San Diego County, nestled up on hills, down in valleys, in small coves and hugging the coastline, break up its population mass. The first Europeans to discover the protective bay were Spanish explorers venturing up the coast in 1542. They claimed the region for Spain in 1769, establishing in establishing the first mission and first presidio, or fort, on the west coast what is now Old Town. In the early 1800s, Mexican families settled in the area; Americans joined them in 1848 following the ceding of California to the U.S. The Old Town ambience today reflects both influences. As the Spanish explorers had before them, the U.S. Navy found San Diego Bay ideally suited for its fleet, establishing in 1919 what has become the homeport of the Pacific Fleet. 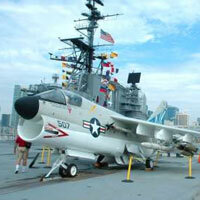 A source of pride to San Diegans, the naval presence lends a distinct character to the area. Multifaceted fleet support, including repair and training, is its mission, and San Diego Bay is busy with naval activity. Huge aircraft are a sight to see; elite Navy SEALS dart around in small training craft; submarines line up at Point Loma; welders’ sparks fly off destroyers docked in the shipyard; Top Guns come in for landings in Coronado. As “America’s Finest City,” San Diego has a lot to live up to and it does not disappoint. Walk along the Embarcadero, pausing to admire the Star of India or to climb through the USS Midway. Find a souvenir, fly a kite or grab a bite to eat in Seaport Village. Experience 19th century San Diego in the historic adobe and wood buildings of Old Town where you’ll also find chalupas and tacos prepared the authentic Mexican way. 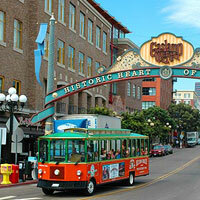 Spend an evening of fine dining or dance the night away in the trendy Gaslamp Quarter. Experience the elegance of the 1920s at the “Del,” the finest of the jewels of picture-perfect Coronado. Spend a day in the museums and enjoy the fountains, flowers and trees in lovely Balboa Park; watch giant pandas munching bamboo in San Diego Zoo. For adventure of a different sort, glide into North San Diego Bay aboard the amphibious Seal Tours of San Diego and see real seals warming in the sun atop floating bait cages. There is this - and much more – all within the city limits. Venture just outside the city for even more. Golf at famous Torrey Pines; browse art galleries and one-of-a-kind boutiques, followed by lunch overlooking a dramatic ocean cove in picturesque La Jolla. Stroll the Mission Beach Boardwalk, packed with surfers and sunbathers; frolic in the largest water park in the world, Mission Bay Park; get splashed by Shamu at Sea World; try ballooning in Del Mar. Drive further out to Carlsbad Flower Fields in the spring to see fields of color when the ranunculus bloom; experience the stark desertscape of the Anza-Borrego State Park; sample wine in the wineries in Temeluca; cross the border to Tijuana; go west up into the hills to Julian, an authentic gold mining town now known for its apple harvest. This is San Diegoland - welcoming, expansive and with so much to see and do - all in a spectacular setting that is delightfully real. In one word: ideal. People living there know it; visitors love it; flowers blooming everywhere show it. Sunny San Diego’s weather is delightfully steady year-round, not too hot or too cold. In the coldest months, December and January, daytime temperatures rarely fall below 66°; in the warmest, August and September, they rarely rise above 78°. Nighttime temperature drops to 49° in January, and rises to 67° in August. In forecaster terminology, San Diego has a “microclimate.” Tucked as it is between the cool Pacific Ocean and the sun-scorched desert, with mountains in between, in the winter choice of weather is but a short drive away. Wetsuit-clad surfers catch waves in the Pacific, cacti bloom in warm Ana-Borrego Desert, and snow caps the Laguna Mountains. It doesn’t rain much in Southern California: November through March averages about 1 ½” per month; in April through October there is hardly a rain cloud in sight. Visitors can enjoy San Diego any time of year. Seasonal changes are slight, reflected primarily in clothing choices: a sweater (and maybe a jacket or sweatshirt) over long pants in the winter; short sleeves and shorts in the summer. There can be a chilly rain on some winter days, making a jacket necessary. The land/sea temperature differential in the spring and summer causes morning fog banks to billow in along the coast and light layering is a good idea. By noon it will burn off, and you’ll shed the layers. Summer is peak tourist season and is particularly popular with families. In spring and fall venues are not as busy, and it’s a wonderful time to visit. Every month heralds outdoor events. April is Little Italy’s annual ArtWalk, the area’s largest outdoor art festival. May celebrates Fiesta de Cinco de Mayo featuring re-enactments, mariachis and margaritas in Old Town. Everyone goes to the 3-week long San Diego County Fair in Del Mar in June. July brings the Summer Pops to the Embarcadero and August and September are the best beach months. In September, the music happening, Street Scene, is so popular it takes place in Qualcomm Stadium. October’s Fleet Week is the nation’s largest military appreciation event. In December, downtown dresses up in holiday finery and the harbor sparkles during the nightly Parade of Lights. An estimated 2005 population of 1,244,540 ranks San Diego as the 8th largest city in the US, but it does not feel like as its population mass is broken up in geographic pockets. Although the city’s median age of 33.5 classifies it as young, in San Diego youth is but a state of mind. Regardless of age, San Diegans are vibrant, vigorous and active, an attitude attributable to the year-round ideal weather and glorious landscape. San Diego is also “smart” city! Over 40% of its population has a masters degree or higher, due, in part, to the large number of biotech companies headquartered in the area. 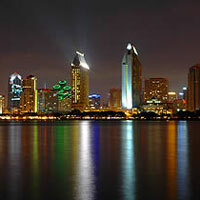 The city of San Diego is 324.3 square miles in size. San Diego County covers 4,526 square miles, with 90% of its 2.8 million people living within 30 miles of the coast. Car: Have a good map and detailed directions before you go as the tangle of freeways can be frustrating. Route 8 is San Diego’s main east/west artery; Route 5 the north/south artery. Many sites in the city enjoyed by visitors are off the 5. Parking in downtown San Diego lots is relatively easy, except during special events, and there is metered parking on side streets. Beach parking in the summer is almost impossible in the free lots near the main beaches. Public Transportation: The San Diego Transit Company runs a bus system operating through the city and county, however, getting to a destination may take longer than you want. 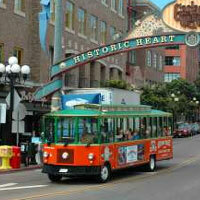 The red, electric San Diego Trolley runs to various points downtown and all the way to the Mexican border. Call each for information or, stop by the Transit Store downtown at 102 Broadway for maps and information. Aboard the Old Town Trolley Tours® of San Diego: A great way to see the city and get around when you first arrive is on an informative narrated tour aboard Old Town Trolley Tours® of San Diego. Not to be confused with the transportation-only red electric San Diego Trolley, this orange and green, propane-powered Victorian trolley on wheels with great viewing windows provides a wonderful narrated tour of all the important points in San Diego, including Coronado and Balboa Park, and gives you the option of hopping off at any of the 10 stops along the tour route to explore on your own. When you’re ready to resume the tour, simply hop back on the next available trolley. Accommodations in the San Diego area reflect the character of the communities in which they are located. Downtown has restored historic gems and bold contemporary structures, each adding to the urbanscape in a unique way. All sophisticated, they are, for the most part, brand hotels. 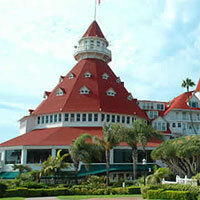 In addition to Coronado’s crown jewel, the lavish, rambling beachfront Victorian-era Hotel Del Coronado, whose red-shingled peaked, turreted and dormered roofline makes it the most recognizable landmark in San Diego, the small community has other historic, architecturally significant, elegant early 1900 mansions converted into hotels. Interesting, elegant and upscale European-style small hotels dot the village streets of La Jolla; Old Town’s more moderate hotels and motels are terraced into the hills around Hotel Circle. Just west, Mission Valley’s brand name contemporary hotels are convenient to upscale malls, restaurants, and Qualcomm Stadium, home of the San Diego Chargers. Point Loma’s resorts are on man-made peninsulas jutting out into the bay; and the recreational aquatic vacation mecca of Mission Bay offers full-service resorts. Before heading out on your own, set aside 2 hours of your visit for this interesting narrated tour of San Diego. You’ll see sights you might otherwise miss, get an insider’s view of San Diego, discover places you’ll want to return to, and pick up some memorable facts about the area along the way. If you choose, you can hop off at any of the 10 strategic stops along the route to spend time exploring San Diego’s unique neighborhoods - museums, shops, restaurants - at your own pace. When you’re ready, simply hop back on the next available trolley to the next stop. 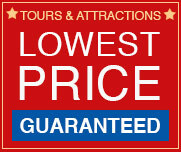 It’s a great combination – a really interesting tour plus the time to venture out on your own. Walk through the Gaslamp Quarter to discover antique shops, some of the best restaurants in San Diego and trendy night spots, all housed in wonderfully restored 19th century Romanesque Revival commercial buildings along 4th and 5th Avenues. On Saturdays at 11 am, a 1-hour guided walking tour of the area departs from the William Heath Davis House. Take a trip back to 19th Century California in Old Town State Park. Walk around Old Town, “The Birthplace of California,” browse colorful shops, visit the ghostly Whaley House, sip a “fish bowl” size margarita, dine on authentic Mexican food. Experience La Jolla’s wonderful boutiques, the Birch Aquarium at Scripps, cliff-side restaurants and the seals at La Jolla Cove. Browse through the shops along Coronado’s Orange Avenue, walk along the sparkling Coronado Beach, don’t miss the fabulous Del. Or, take a 1 ½ hour walking tour of the small town offered on Tuesdays, Thursdays and Saturdays. The rugged, long peninsula protecting San Diego Bay from the Pacific Ocean has a breathtaking 360° degree view: miles of beaches to the north; the powerful Pacific to the west; busy San Diego Bay to the east; and to the south, the lovely San Diego skyline, Coronado and Mexico, off on the horizon. Before heading up to the top, stop by Point Loma Seafoods to pick up a picnic of the freshest seafood in San Diego. You can visit the Carillo National Monument, honoring the discovery of San Diego Harbor in 1542, the quaint Point Loma Lighthouse, and walk the 1 mile Bayside Trail, lined with native vegetation: yucca, prickly pear cactus and Indian paintbrush and with wonderful views. Spend a day surrounded by choices appealing to every interest and age. The scientific and engineering minded will enjoy the San Diego Hall of Champions Sports Museum, San Diego Model Railroad Museum, Reuben H. Fleet Science Center with IMAX Theater, San Diego Automotive Museum, or San Diego Aerospace Museum. 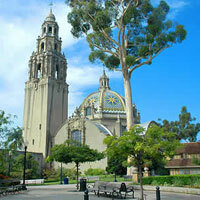 For naturalists, a visit the San Diego Natural History Museum or the San Diego Museum of Man is a must. Art lovers won’t want to miss fine art at the San Diego Museum of Art; folk art in the Mengei International Museum; documentaries and still images at the Museum of Photographic Arts In between venues, pick up a sandwich from a snack cart for lunch by a fountain; have a leisurely lunch in the flowered courtyard of the Prado Restaurant or tea in the Tea Pavillion in the Japanese Friendship Garden; pause for an hour at 2 pm on Sundays for a thoroughly enjoyable and inspiring organ concert in the grand Spreckles Organ Pavilion. The internationally acclaimed resort, flamboyant in a white framed exterior with gingerbread detail and a red roof layered with turrets and towers, spreads out over the perfect oceanfront site. Built in 1888 for the fabulously wealthy, presidents, dignitaries and movie stars have stayed there; Some Like It Hot was filmed there. Admire the ornate interior, have a drink in the Babcock & Story Bar, browse through the shops, or treat yourself to Sunday Brunch in the magnificent chandeliered Crown-Coronet Room. Four football fields in size, lined with airplanes on display, including an F-14 Tomacat, the flight deck is but one segment of the interesting on-board tour conducted by docents, many of whom served on the carrier and flavor the tour with personal recollections. Board whale-watching excursion boats between late December and late February, many departing from the Embarcadero, to experience sightings of the huge marine mammals on their migratory journey from Alaska to the warmer seas off Baja California. The simple, pre-fabricated saltbox house, shipped around Cape Horn 1850 and assembled in San Diego, is the oldest wooden structure in the city. 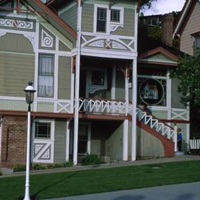 Located in the Gaslamp Quarter, it was one of the first residences in “new” San Diego. Giant pandas, cute koalas and diving polar bears are in residence in the remarkably natural surroundings in the world’s finest zoo. Walk the lush grounds, take the Skyfari for an aerial view, and lunch at Albert’s Restaurant. Check in the weekly San Diego Reader for schedules. Attend a play at one of the Old Globe Theaters – inside in grand style, intimately in the round, or outdoors. Overwhelming to the senses, there is music, food, souvenirs and colorful confusion. Effective in 2008, you’ll need a passport. San Diego is a great place for children! Visit pandas, koalas and 4000 other creatures in San Diego Zoo. While in Balboa Park, engage in child-size interactive exhibits in the Reuben H. Fleet Space Theatre and Science Center; dig in an archeological site and build pyramids in the Children’s Discovery Center at the San Diego Museum of Man. Spend time in SeaWorld at the awesome shark encounters, watch penguin antics, get splashed by Shamu. Splash down in the bay aboard the San Diego SEAL to see submarines and seals too. Go to the Children’s Pool in La Jolla, not for a dip, but to watch the seals, who have claimed it as their sunning spot; go to the Birch Aquarium at Scripps to see fish, the underwater kelp forest exhibit and creatures in the tide pools. Further northeast, see rhinos, antelope, giraffes and elephants in as natural a habitat as possible in the Wild Animal Park; visit Legoland®, where everything imaginable is made of Legos. As though this weren’t enough, top it all off with a grand finale for kids and adults alike: ride the “Giant Dipper,” the seaside roller coaster in Belmont Park. Each of San Diego’s neighborhoods has a distinct character. All have a casual lifestyle and a connection to the outdoors that is reflected in everything – in the architecture: terraced balconies, patios for dining, picture windows opening to the view; in the stunning natural landscape: people-friendly parks, sidewalk-lined harbors made for walking, varied terrain for cycling, challenging waves for surfing; miles of beaches for swimming, tide pools for viewing; in the leisure venues: sidewalk cafes, dinner cruises, bandstands, boardwalks, outdoor theater, golf courses, trails, parks and wineries. Downtown San Diego is a cosmopolitan city tucked into a compact space. Beneath a skyline of soaring contemporary office buildings, a white sail topped convention center, and thoroughly modern residential loft apartments are harbor-side parks and tree-lined promenades. There is great shopping, street level or in showy Horton Plaza. Upscale restaurants, comfortable cafes, hot jazz and dance clubs, and rooftop lounges are housed in restored Victorian-era commercial buildings along bricked sidewalks lined with period street lamps in the busy Gaslamp Quarter, the place to be seen. 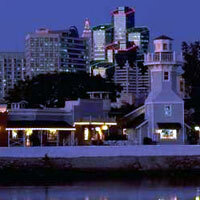 The harbor along the Embarcadero is active with the comings and goings of vessels of all vintages, shapes and sizes. Visit the historic ships of the Maritime Museum of San Diego, spend time in charming Seaport Village, go whale watching off shore, admire the “Urban Trees” and other outdoor sculpture, sample fresh seafood, and check out the tuna fleet. The up and coming artsy East Village, location of PETCO Stadium, home of the Padres, is an exciting post-modern rejuvenation of a former industrial area. Equally hip and undergoing similar revitalization is Little Italy, with sidewalk cafes, eclectic art galleries and funky boutiques. Balboa Park feels like a fantasy city. 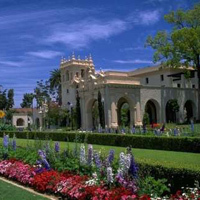 Richly ornament buildings, in Spanish Revival architecture embellished with touches of baroque, fountains, manicured gardens with meticulously placed plants, flowers and trees create a storybook ambience. In addition to wonderful architecture and gardens, America’s largest urban cultural park offers the visitor incredible museums, appealing to every interest, theaters, restaurants, an outdoor organ pavilion, and even San Diego Zoo. Exhibitions, programs, plays, events and fairs take place year-round in the many venues within the 1200 acre park. Coronado, a charming village community with small, locally-owned stores and an open-air grandstand, has the nostalgic look and feel of small town USA. Visitors stream over high-rise Coronado Bridge, dazzled by the spectacular view below, then descend into a small town atmosphere to shop and dine along Orange Avenue, the main thoroughfare, spend time at the 2nd best beach in America, visit the grand Hotel Del Coronado, the historic, regal centerpiece of the island, or enjoy a round of golf at the pleasant Municipal Golf Course, nicely laid out along the bay front. Mission Beach and Pacific Beach are beach communities epitomizing the California beach culture. Year-round residential communities, both are crowded, ageless, tolerant, laid back, and retro. Beach crowds pack in every day - a parade of surfers, sunbathers, and cruisers. There are boardwalks, roller coasters and beach volleyball; night spots, beachfront bars, burger shacks, taco stands; stores with trinkets, souvenirs, beachwear, surfboards, boogie boards, beach bikes and blades. La Jolla, “The Village,” is an upscale coastal enclave, and it is a jewel. With the look and feel of the Riviera, it is both quaint and spectacular. Its drama comes from buildings perched along a landscape of cliffs, coves and caves plunging into the sea; its charm lies in narrow streets lined with buildings in a mix of Mediterranean and contemporary architecture, outdoor patios and cascading flowers. Chic boutiques and fine restaurants line Prospect Street and Girard Avenue. The pink stucco La Valencia Hotel, “La V,” and other boutique hotels overlook dramatic coves and village streets. La Jolla is more than just a place for the rich and famous. Art galleries, the La Jolla Playhouse at UC-San Diego, the Museum of Contemporary Art, Scripps Institute of Oceanography and the Birch Aquarium make it a research, education and cultural center as well. Buick Invitational – San Diego’s premiere annual golfing event. Since 1952, the Buick Invitational has tested golfing’s best! Fiesta Cinco de Mayo - In 1983, Old Town’s Bazaar del Mundo created the Old Town Fiesta Cinco de Mayo, an event designed to commemorate the 1862 Battle of Puebla, during which, out-numbered Mexican forces defeated the French Army, setting the stage for Mexico’s eventual triumph over French imperialism. Since that time the event has evolved into our region’s largest celebration of Hispanic culture, San Diego and California’s history, diversity and the arts. In 2005, the event becomes Old Town Fiesta Cinco de Mayo, along with the name change, comes a host of exciting additions and changes. Adams Avenue Street Fair - Southern California’s largest FREE two-day music festival. The Adams Avenue Street Fair includes more than 70 musical acts performing on six stages spread out over an eight-block area. Street Fair-goers will enjoy a variety of music, including blues, rock, world, alternative, roots-rock, jazz, reggae, zydeco, alt-country and acoustic. In addition to the electric and eclectic music, there are giant carnival rides, family activities, more than 300 food, arts, craft vendors selling their specialties throughout the Street Fair venue and three beer gardens. Fleet Week - Heralded as the largest military appreciation event in the nation, Fleet Week San Diego offers civilians an opportunity to learn about the military by experiencing fighter jet demonstrations, touring Navy ships and taking part in military traditions. Where: Events held at various locations throughout San Diego County. San Diego Thunderboat Regatta – The fastest boats in the world compete for the Bill Muncey Cup. Expect speeds up to 200 mph as they battle for the championship. San Diego’s largest sporting competition and premiere beach festival is fun for all ages… fireworks, live entertainment, interactive displays, and fun in the sun! Christmas in San Diego - From late November through the holidays San Diego becomes a city of lights in celebration of Christmas. A “must do” is a visit to The Festival of Lights at Old Town's Bazaar del Mundo. Be sure to visit the December Nights festival in Balboa Park where visitors will find crafts, food, decorations, and caroling. La Jolla Christmas Parade and Holiday Festival, Coronado Holiday Lights Walk, and at the San Diego Bay lighted boat parade are other Christmas in San Diego festivities that are fun for the whole family!. All too often when visiting a city we miss special places because they are either better known to locals or are outside of the hub of greatest tourist activity. For those who enjoy touring historic homes, two, open only Friday through Sunday, are often missed. The1887 Queen Anne Villa Montezuma is an ornate mansion with an opulent interior of spectacular stained glass and ornate wood carving. The1905 Arts and Crafts style Marston House in Balboa Park is filled with original furniture and decorative arts. In stark contrast, the simple, white adobe Mission de Alcala, elements of which date to 1774, was California’s first Spanish mission. Originally in Old Town, it was moved 5 miles east to Mission Valley where it is open daily. 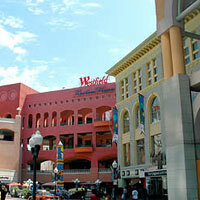 Shopping in San Diego is synonymous with Horton Plaza, the boutiques of La Jolla or the shops in Coronado. For other shopping ventures enjoy three floors of antiques in the The Cracker Factory in the Gaslamp Quarter or find unique handmade gifts made by working artists in their studios at the Spanish Village Art Center in Balboa Park. In Ocean Beach, there is more than just the beach scene. Hunt for antiques in the 6 malls of the Ocean Beach Antique District along Newport Avenue, where hundreds of antique dealers gather. Further up the coast in Del Mar, shop in boutiques, galleries and restaurants along winding stone walkways in Del Mar Plaza, tucked into the hillside. Yet further north, and on weekends only, browse through the unique and unusual Encinitas Seaside Bazaar, an open-air, European style flea market. All around the county, year-round, on any day except Monday, San Diego Farmers’ Markets display the most luscious fruit and vegetables and the most gorgeous flowers grown anywhere. For more active nature encounters and dramatic views, walk the trails and visit the war memorial at Mount Soledad, the hill behind La Jolla distinguished by a 43 foot cross. Along the La Jolla Coastal Walk between La Jolla Cove and Children’s Pool, you’ll find yourself high above ocean and down in tidal pools. Just north of La Jolla, hike the 7 mile trail though the forest of rare, gnarly Torrey pines, protected in the Torrey Pines State Reserve. Along the way, come upon spectacular ocean views, sculptured cliffs, wildflowers and a chance sighting of daring hang gliders taking off from 300 foot cliffs. For a day trip, venture inland. Drive to Escondido through agricultural fields and vineyards, open for tours and tastings. For a glimpse of a town straight out of gold rush California, raw and dusty, visit Julian. Surrounded by mining land now converted to orchards, it is just as popular for apple pie as it is for the restored 100 year-old buildings of the original mining town. Sip sarsaparilla tea at the soda fountain in the Julian Drug Store or cider at the Julian Café and Bakery, surrounded by Wild West memorabilia. Check out the early 19th century odds and ends found in local attics on display at the Julian Pioneer Museum. You’ll find ample free things to do in all of San Diego’s communities. In Balboa Park, many things are free. There are free walking tours of the park, and each museum is free one Tuesday per month, on a rotating basis. 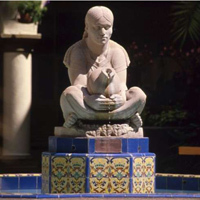 Call the Balboa Park Visitors Center for information (619-239-0512). If you’re in the park on Sundays at 2 pm, treat yourself to a magnificent organ concert in the Spreckles Organ Pavilion. On any day of the week, walk through lovely tropical and flowering plant exhibits in the domed, wood lath Botanical Building and enjoy the spontaneous activity around the Lily Pond. Take a walking tour of Old Town San Diego State Park at 11am and 2pm daily, or use the map inside the Old San Diego Gazette, free at local stores, to tour the restored adobe and wood houses and businesses on your own. Walk through nearby Heritage Park to admire the collection of restored Victorian homes clustered in a park setting. Kick off your shoes and walk along Coronado Beach, one of the top 10 beaches in America; watch the seals frolicking and sunning in La Jolla Cove. In Pacific Beach, stroll along the boardwalk and check out the quaint cottages of the Crystal Pier Hotel, built out over the water in 1920. Watch the radio-controlled planes when they are flying at the South Shores Boat ramp at Mission Bay. If you are exploring the Cabrillo National Monument at the end of Point Loma, be sure to see the Cabrillo tidepools at low tide. Between mid December and mid March, you might catch sight of the massive gray whales on their migration journey from the glass-walled Whale Watch Lookout. San Diego has no shortage of spectacular views – the best view of the San Diego skyline is from the Coronado Ferry Landing; for the best sunset, head out to Ocean Beach Pier. On all these adventures, don’t forget your camera. 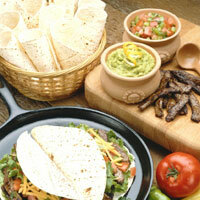 Dining in San Diego is a sensory experience - as much ambience as taste. The taste comes from the freshest seafood and bountiful fresh produce, main ingredients in the California cuisine, Asian fusion, Italian dishes and authentic Mexican fare found on San Diego menus. The atmosphere comes from glorious weather, a dramatic landscape and a historic downtown, wonderfully restored. The ideal weather lends itself to al fresco dining - on a pier, along the beach, overlooking dramatic coves; with views of the ocean, active bayfront, or glittering skyline. Dine in courtyards and patios; along city sidewalks; in parks and gardens. The largest concentration of dining options is in the Gaslamp Quarter. Sleek, glossy, warmly comfortable or intimate, all are cosmopolitan, housed in restored historic structures creatively adapted to urban dining and have inventive names and menus. Try Tuscan cuisine at Acqua Al 2, Asti Ristorante and Osteria Panevino. Chive boasts “cuisine moderne;” Aubergine’s menu is Asian inspired. There’s always live music at Croce’s; enjoy Flamenco dancing and tasty tapas at Café Sevilla. Nearby, smooth and savory Thai cuisine and works of art go hand in hand at Saffron, while Hash House a Go Go serves huge portions of ordinary food with extraordinary twists. Views, views, views - Downtown, enjoy cocktails and a spectacular view at the Top of the Hyatt. Bertrand’s at Mr. A’s serves French and California cuisine along with sweeping views of Balboa Park and San Diego Harbor. Along the Embarcadero, views of the busy bay and seafood reign at casual Fish Market, the dramatic Star of the Sea or Anthony’s Fish Grotto. Island Prime on Harbor Island near the airport also has a harbor views. In La Jolla, George’s at the Cove and Trattoria Acqua have grand Pacific views and great food; in the Marine Room sit beside special windows made to withstand the Pacific waves crashing against it. Coronado offers elegance and views in the Sky Room in the “La V” and the Top of the Cove and a beachfront cabana atmosphere in the new 1500 Ocean at the Del. For something tasty on the run, line up at Kansas City BBQ, of Top Gun fame, just across from the Convention Center. Find casual, beachy fare at Mission Café in Mission Beach, near the boardwalk, or grab a fish taco at Rubios. Savor authentic regional Mexican flavors at El Agave Tequileria in Old Town, Mexican fare and strolling Mariachis in Casa Guadalajara or the best carne asada burritos at La Posta #8. In Balboa Park, El Prado Restaurant’s hacienda décor is a fitting backdrop for its Mexican and California cuisine. Save enough room for Extraordinary Desserts at the edge of Balboa Park, or pick up something chocolate-y from Chi Chocolate in Little Italy. Wrap up the evening in one of Gaslamp Quarter’s sophisticated clubs and hot nightspots. Futuristic in chrome slashed with neon colors or in stark black and white, with cushy leather couches, spectacular dance floors, and bars, long, sleek, or roof-top with fire pits and incredible views, they are the places to be seen. Hip places - Stingaree, Deco’s, Confidential, Altitude, JBar, Thin, Red Circle, Beach - are but a few.